If you've ever admired the exquisite stitches of an embroidery project you just completed only to feel bad about the cost of your design, you're a perfect candidate for embroidery freebies. You no longer have to pay for patterns and software, thanks to the Internet. Sometimes you can get fabric and floss for free as well if you know how to look in the right place. You can get literally hundreds of embroidery freebies by going to the following sites, which offer complimentary patterns. Some are for embroidering by hand and some are for machine embroidery. Free Embroidery Stuff has great seasonal patterns, like candy canes for Christmas and champagne for New Year's. It also has licensed cartoon character patterns, occupation patterns and others. Kreations by Kara offers a free pattern each month, and patterns from previous months are also available on the site. Craft and Fabric Links has hand embroidery patterns, including a huck weave pattern and a floral, decorative pattern. Embroidables has embroidery freebies for the machine mixed in with its paid designs. You can tell a pattern is free if the price on the listing is $0.00. You don't have to make a purchase to download it without paying anything. This is not an exhaustive list of sites with embroidery freebies. There are dozens more that offer one or more free patterns. Another way to get free patterns for hand embroidering is to download coloring pages from a site like Crayola.com. You can transfer the designs from these pages to your fabric using a transfer pen or carbon paper. 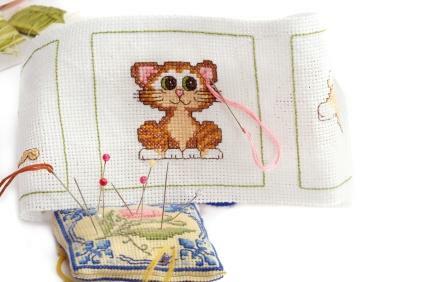 Then you can choose any colors and stitches you wish to use to fill in the lines. Before you download free software, make sure your antivirus software is up to date, especially if you're downloading it from a website you are not very familiar with. This is the best way to avoid downloading malware at the same time. Another good place to look for embroidery freebies is at your local craft or fabric store. Sometimes you can get free fabric if you ask at the cutting station. There may be remnants available that the employees are unable to sell. You can't be picky about the fabric you get, though. It is unlikely you will receive a top seller. You can also get fabric inexpensively at thrift stores and yard sales. While not exactly an embroidery freebie, repurposing fabric you already have comes close. For example, you can embroider on old sheets or pillowcases to make them look like new. The same goes for old towels. Free embroidery floss can be more difficult to come by. You're more likely to find an offer of free floss with purchase than just by itself. However, you can try contacting companies that produce embroidery floss and requesting samples of their new colors. Also check out freebie boards, such as Fatwallet.com. You never know when an offer will come up.